I owe most of my ethnic food knowledge to my mom who prepared and taught my siblings and I to appreciate diverse flavors from a young age. Some of my fondest food memories were when our family hosted internationals in our home over the summers or holiday breaks. We’d take these students grocery shopping and let them plan and prepare their country’s traditional cuisines in our kitchen. It was an amazing way to break through difficult communication barriers and better understand their cultures and backgrounds through food and tradition. I still use some of their techniques and flavoring tricks in my recipes today. Tabbouleh is commonly eaten in Eastern Mediterranean (Levantine) countries. 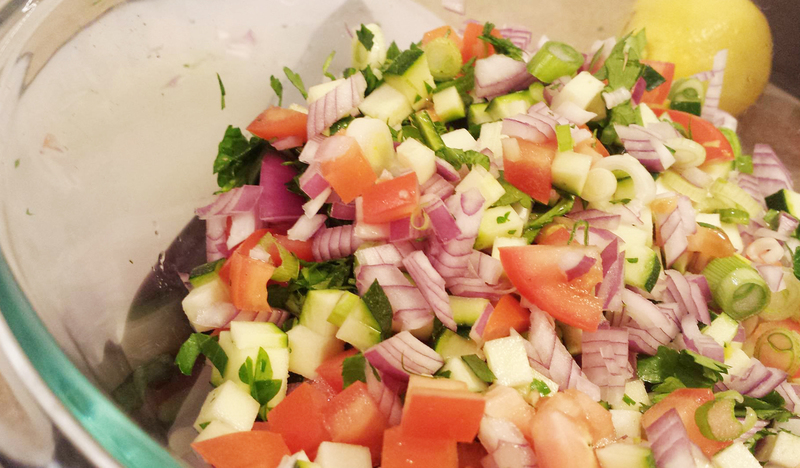 It is a dish traditionally prepared with chopped parsley, tomatoes, cracked wheat (bulgar) mint, and red onion. It’s usually simply dressed with olive oil, lemon juice, salt and pepper. My mom would serve it to us growing up with falafel and yogurt dip and I couldn’t stand it. Good thing my tastes have sophisticated because this salad is so addicting. If parsley isn’t your thing the recipe still work sans parsley…you’ll just miss out on a antioxidant punch. You can swap spinach for a milder flavor. I deviated from the traditional cracked wheat in exchange for quinoa because I needed the recipe to be gluten free but also was seeking a boost of protein to make it an easy meal on-the-go. 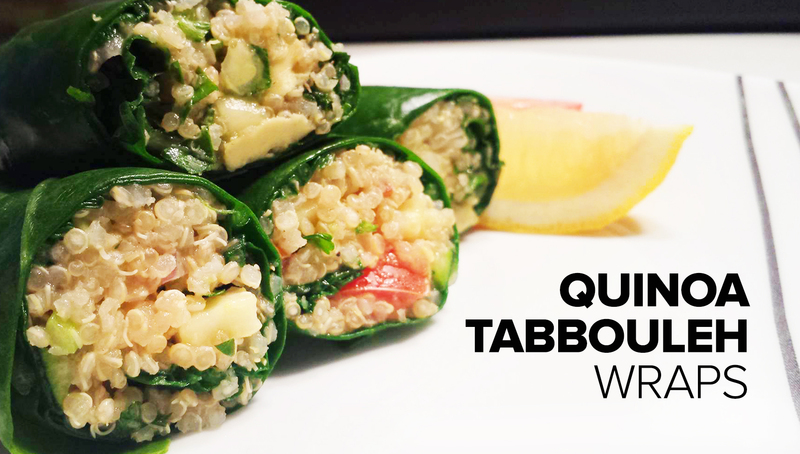 Tabbouleh is typically served cold but this quinoa version is amazing both warm or chilled. Mixing the dressing and ingredients into the warm quinoa makes the flavors pop and everything sort of melts in with each other and gets absorbed by the quinoa’s little curls. The end result is a nutty, lemony, fragrant salad. 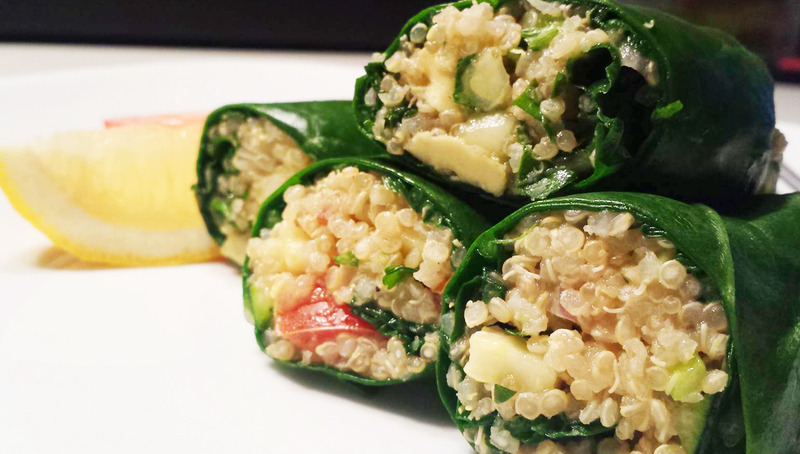 I chose to make this version of tabbouleh wraps using rainbow chard because it’s in season and a nice hearty leaf that’s easy to wrap stuff up in. I flash blanch them to soften the leaves and make them easier to roll. You can use lettuce or collard greens or just eat the salad on top of a bed of spinach. I’m just always on the lookout for ways to pack greens into every meal. On medium high heat bring all the quinoa prep ingredients to a boil. 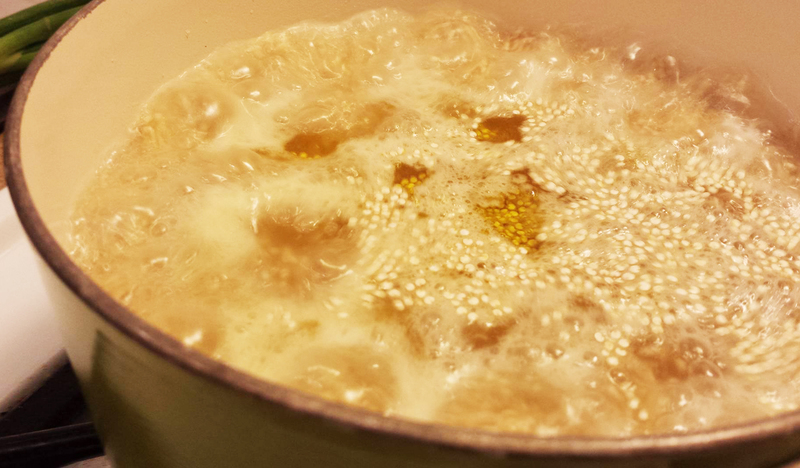 Boil 10 mins until most of the water is absorbed then turn the heat to low and cook until quinoa is fluffy. There should be no water at the bottom of the pot. 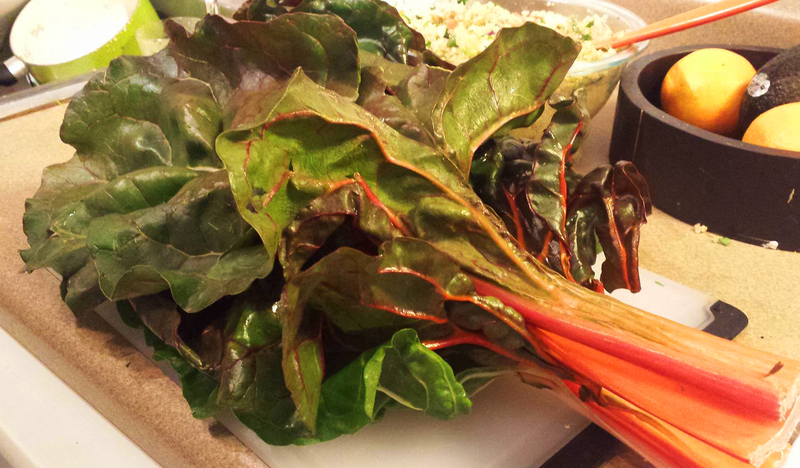 Fill a large pot up with water and bring to a simmer for flash blanching the rainbow chard. 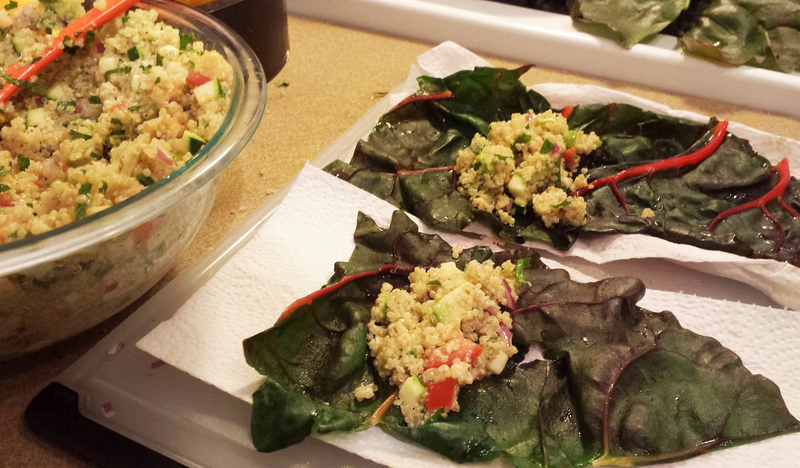 While the quinoa cooks chop all your veggie add-ins into a small dice and place in a large bowl. Make sure your onions and scallions are very finely chopped. In a small bowl whisk all the dressing ingredients together until smooth. 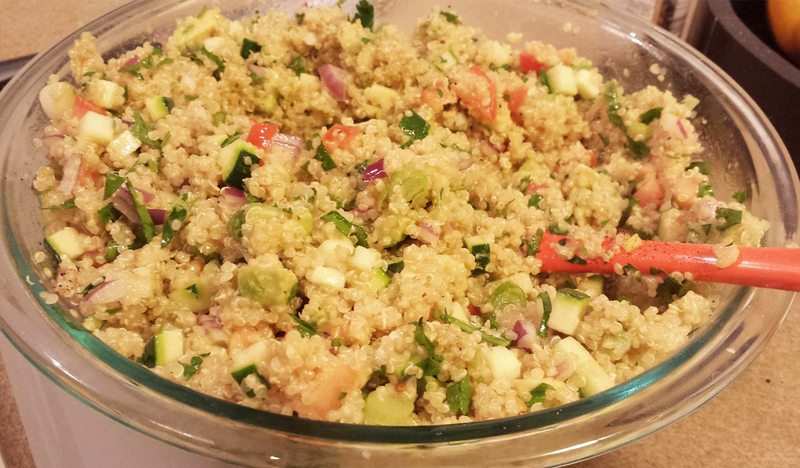 Pour your quinoa into the chopped veggies and stir in your dressing. Mix well until everything is well incorporated. Dip each half leaf into simmering water to blanch them and then pat dry with a paper towel. 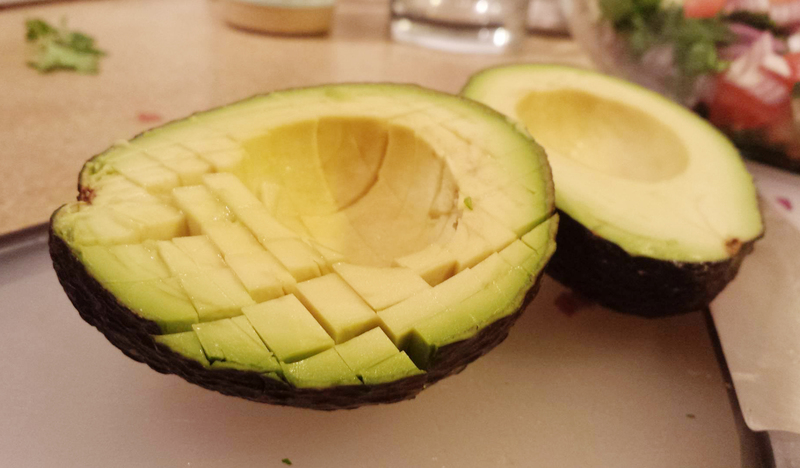 This makes the leaves more malleable and easier to wrap ingredients in without tearing. 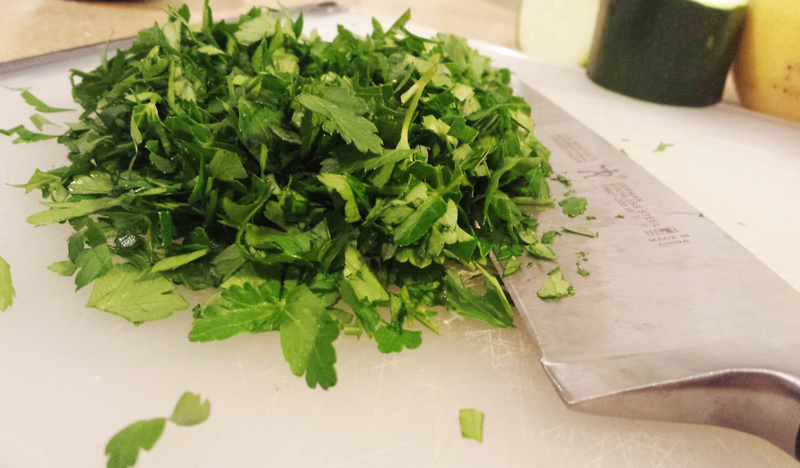 Lay your blanched leaf out on a cutting board and put about a quarter cup of tabbouleh on the end. Roll up the sides and corners. It's easiest to roll away from your body.